After pick-up we drive past Mandela's last home before his death situated in Houghton. 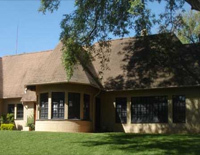 Visit Liliesleaf - Liliesleaf aims to bring the events that took place in Rivonia 45 years ago into South Africa's current socio-political context by allowing the original infrastructures to recreate the living and working environment at the time of the raid. The restoration process was a collaborative effort between archaeological findings, oral recollections and archival and historical research to document the history of the liberation struggle for current and future generations. Onward to Constitutional Hill which is located in Braamfontein one of the original suburbs of Johannesburg. Located here is the modern Constitutional Court which plays the role of protector of South Africans' basic rights. Next door is the Old Fort which was established at the time of the Anglo Boer War and was used by both the Boers and the British. 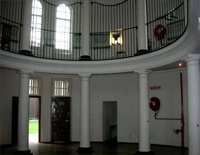 It also became a prison where political prisoners including Nelson Mandela and even Mahatma Gandhi were imprisoned for a time; as well as some of South Africa's most notorious criminals such as Daisy De Melker. We stop off and learn more about the history of these contrasting symbols which have played a fascinating roll in SA history from Colonialism through Apartheid and now on to Democracy. We head over the Mandela Bridge to Newtown which is a great example of Johannesburg's Urban upliftment project which aims at bringing more people back in to the city centre to live, work and of course play. Here we walk around the flea markets and soak up the new South Africa in its colourful form. A delicious lunch will be enjoyed at a restaurant in the Newtown area or at a venue on Vilakazi Street in Soweto. Enter Soweto via the up-market area called Diepkloof Ext where some of the houses can cost in the millions. In complete contrast we visit a large hostel in the area, in days gone by the notorious hostel system was used as single gender accommodation for migrant laborers, it is now used as informal lodgings for family units. Drive through the Kliptown Squatter camp, on the 'Old Potchefstroom' road, where the twin towers will be found. 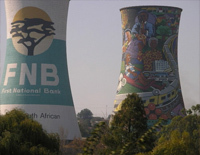 These towers used to supply electricity to the north of Johannesburg, also known as the Cooling Towers of Soweto. We visit Freedom Square where the famous freedom charter was drawn up in 1955 and parts of which still feature in our current constitution. Our last stop will be Regina Mundi Church. This is one of the biggest Catholic churches in South Africa. The Reginal Mundi Church is the focal point of much of the struggle in the 70's and 80's and home to the famous Black Madonna and Child painting. This church is also known as "The Parliament of Soweto"
The tour bus will drive through Vilakazi Street, which is the only street in the world where two Nobel Prize winners lived: Nelson Mandela & Desmond Tutu. 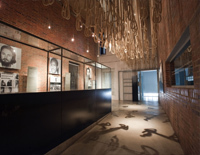 Visit the newly revamped Mandela House and Visitors Centre in famous Vilakazi Street which is filled with many interesting artifacts and memorabilia pertaining to South Africa's greatest icon. We reserve the right to change the itinerary if we feel different venues or options may be better on the day. Tour formats and timings can change dependant on guides, supplier availability and time constraints. If any extra options are included then some of the original tour programme may have to be taken out so we can fit in with time restraints. Lunch at Maphungubwe can be exchanged for lunch in Soweto. A highlight of a visit to Soweto is a delicious lunch at one of the well run restaurants patronized by both tourists and locals alike, offering typical "township" cuisine. Desserts and drinks are not included. Our standard tours depart from and return to the Rosebank & Sandton Areas - located in Johannesburg Central-Northern Suburbs.